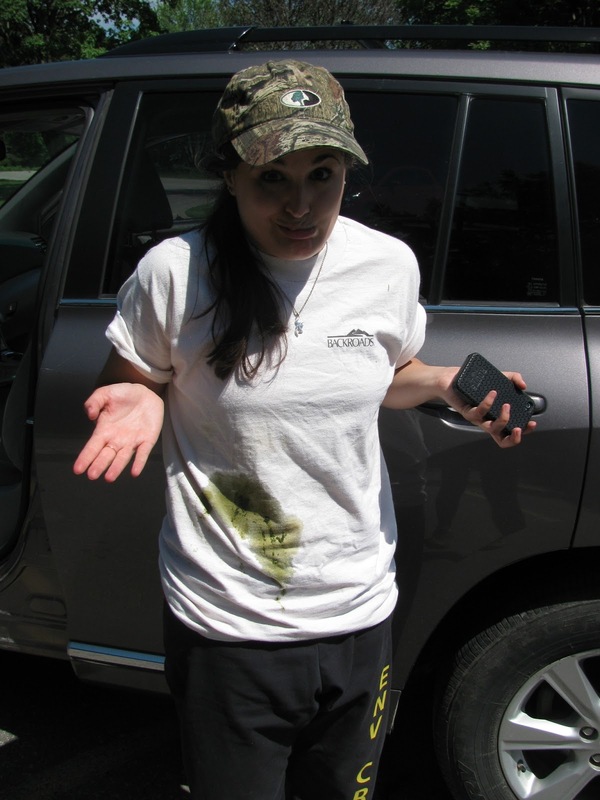 Ramblings of a Wildflower: Goose banding! I have so much to catch up on from the last little bit! I apologize that work and applying to jobs/house hunting/exploring Toronto has pretty much taken the best of me! I was able to go out into the field again the other week with my coworker Lauren to go Goose Banding!! I had done goose banding before but never got to go right into the pen, boy was it intense! All waiting to be banded! For those who don't know, Canada geese are yearly banded by the Canadian Wildlife Service. This entails rounding the geese up who are flightless (geese shed their flight feathers and are unable to fly for a period of time) and then place a metal band (almost like a bracelet) around their leg. The number on their bracelet becomes their identifier. Newly banded gosling running for freedom! - when geese breed do they stay near where they were born or do they move to another location? - where were these geese killed when shot by hunter ( hunters call in tags when shooting a banded goose or duck). We went out with two of the Waterfowl biologists at CWS and surveyed a large area of central-eastern Ontario. The day began driving around until you spot geese, rounding them up while another sets up the holding pen, keeping them as calm as possible, and one by one banding the adults and babies (or collecting data on those who are already banded). After two ears from bandin last, I forgot how feisty they are!! Trying to pick then up,find their gender, and put a band on them was quite the task. I'll admit that each and everyone I got a wonderful shirt full of goose poop, one which thankfully missed my face by inches...who knew geese can projectile poop! Many times local people would notice is and come by to watch and ask questions. One of my favorite things about the work I do is talking to people about it and teaching them, breaking down both barriers to the natural world and stereotypes. There were two big stereotypes that I learnt about on this trip. The first being the two very different groups of people who decided to watch us as we banded. The first group were very interested and curious, coming right up close. While this is awesome, they don't realize that these are 'wild' animals and get really frightened at sudden movements! When asked to stand back, they did and continued to ask a bunch of questions and really educated themselves which was really awesome! One of them even showed us this massive bee colony she has on her tree (and of course how she could get rid of it without killing them!). A few others got really excited thinking that we were going to transport them away! (Which, since they can fly...is just a bandaid solution unfortunately!) The second group, which were few, were those who were skeptical and worried about the geese as they can get really stressed and sometimes walk over one another. Explaining to them why we band, how we do it, and even to the way we stand and move to make sure they are as spread out as possible, and watching how fast we move to get them banded quickly, all helped ease the worry...which then always turned to curiosity! My favourite topic is when people get VERY excited at the Mute Swans. Yes, they are beautiful. No, they are not native. And no...they are most certainly not nice, in fact, they are HUGE bullies. Mute swans are those massive white birds with a brightly coloured orange bill. They were introduced as a gift from England. There are 2 swans that are indeed native to Canada, the Trumpeter and Tundra, but these two instead have a black bill and are found more north during summer. If you've ever looked onto a lake where there are Mute Swans, you may (or may not) have noticed that there is a very large distance between them and the next bird that is on the water surface. This is because they are very territorial birds, often attacking and killing others that come near it. They also are very destructive to the environment digging up the bottom surface throughout most of their territory, meaning a variety of plants aren't able to grow. Different agencies have permits to oil eggs (applying a thin layer of oil to an egg will not allow oxygen into the shell, thus the embyro wont develop) to try and help keep the numbers down. This will allow for a greater diversity of waterfowl and other birds to nest and live in these areas. It's quite the hot topic as for many people they are quite majestic and beautiful. Hopefully understanding the large impact that they are having will make a few more understanding people. I am SO SO happy that I was able to head out on this trip. I learnt so much, not only about geese and banding, but a little more about myself and what I wanted to do "when I grow up". The guys (and gal) we went out with were great to talk to and I really hope that I will be able to head out there again next season! 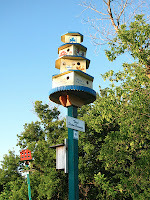 On the drive back we stopped at my favourite spot in Picton, ON called Birdhouse City! 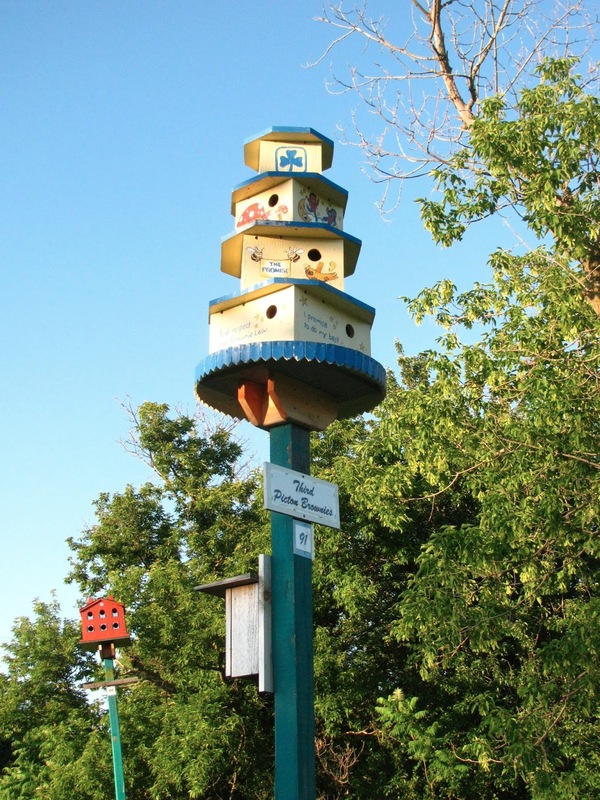 It is this amazing area within a conservation area that is just covered with these amazing bird houses! Most are sponsored by a group around town so you'll see a McDonald's house, hotels, salvation arm, airplane, historic buildings, etc. It's quite the awesome place to hang around and see!! Lauren and I out at Birdhouse City!